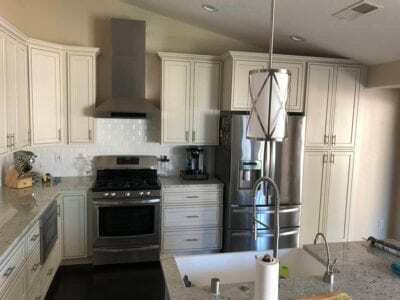 This Tracy kitchen remodel was more than a simple renovation – it was a transformation. For most families, the kitchen is where we spend most of our time. For young families, this is even truer. 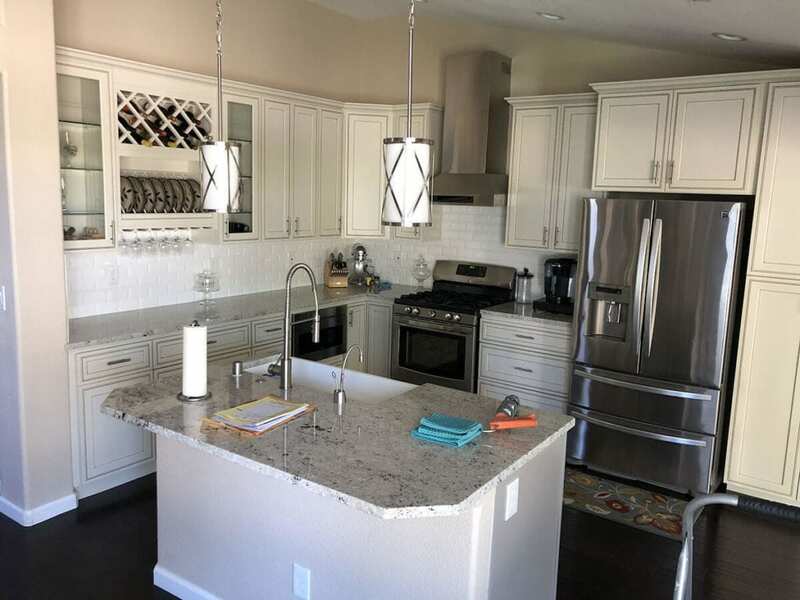 The kitchen easily gets taken over by bottles, dishes, and all the messes in between. When we first met Alicia and Anthony, they were excited to transform their cramped kitchen into a much more useable space. Their lives were very busy with their young daughter. As a result, their kitchen often felt overwhelming. We also have a busy family with young kids, so we can relate! So we got to work on this kitchen remodel right away. Their refrigerator and oven were new and in great condition, so there was no need for replacements. Their laminate floor also looked great, so we preserved that as well. 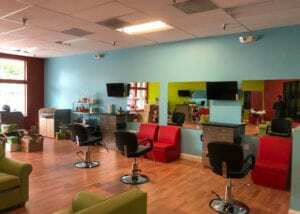 Take a look at the strip of counter on the left side of this photo. That area held an under-sink cabinet, the dishwasher, and a space used as a drying area. It was functional, but we knew we could make big improvements. We decided to rip this entire section out and move it to a more functional island. 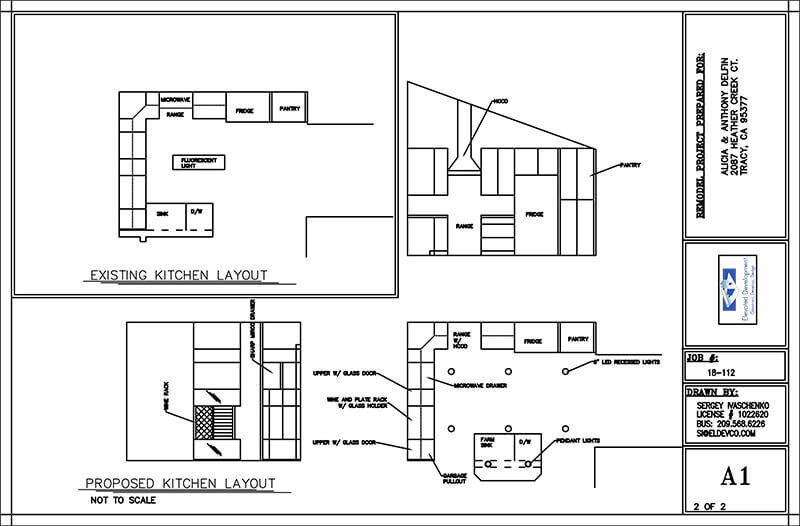 By adding an island, the kitchen opened up to the rest of the house and added more counter space. 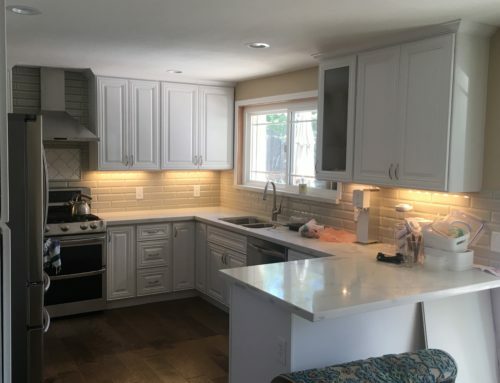 As you can see, the strip of counter that separated the kitchen from the rest of the house was removed, and a new island installed. We felt that this was a really nice touch to the kitchen. 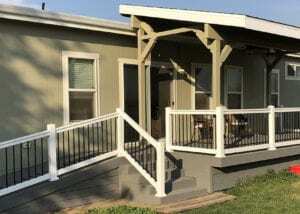 It made it much more functional by creating walk around access. 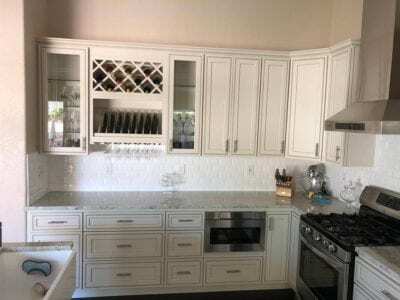 The original cabinets were a light oak, put in by the home builder. They were pretty standard in many homes built ten or more years ago. 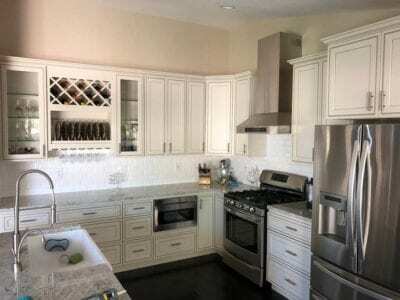 Modern kitchens have embraced a more clean look, with white cabinetry, which we love. This family wanted to upgrade the entire look of the kitchen with white cabinets. We also noticed that the cabinets could be made much taller and provide much-needed additional storage. There was quite a bit of wasted space between the tops of the cabinets and the ceiling. 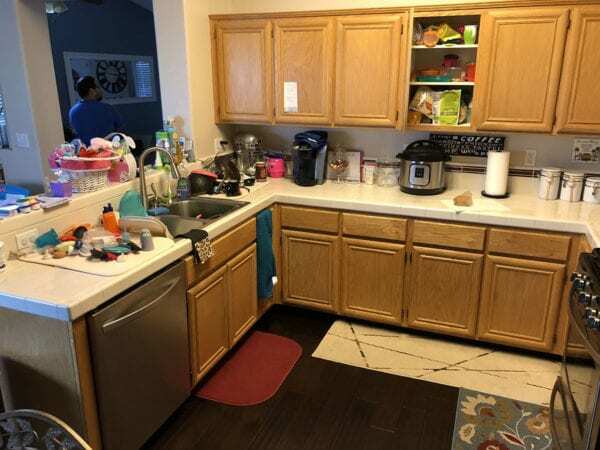 We shortened this distance a bit, which not only provided more storage, but gave the kitchen a much cleaner look. Since their laminate flooring was so dark, we chose cabinet doors with dark insets. These insets, along with the stainless steel door handles, contrasted very nicely with the floor and appliances. Did you catch the sink at the end of the video? We wish we had gotten a better photo of it. The modern apron sink, also called a farm sink, is yet another eye-catching piece of this family’s beautiful new kitchen. We just have to talk about our most favorite part of this remodel: this custom-built storage area. 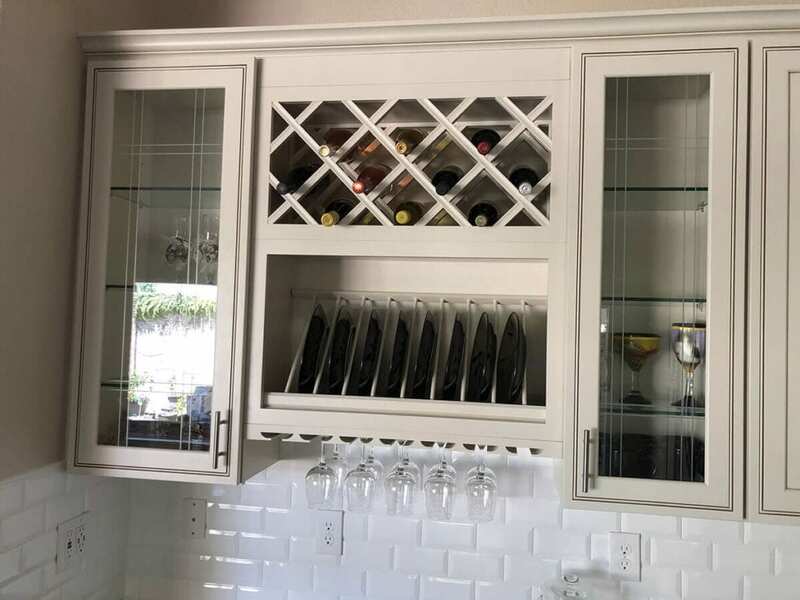 The wine cabinet, glass holder rack, and plate rack really classed up the kitchen. The glass doors on either side tied it all together and made for an eye-catching storage solution for this family. We couldn’t be more pleased with how this kitchen remodel turned out. 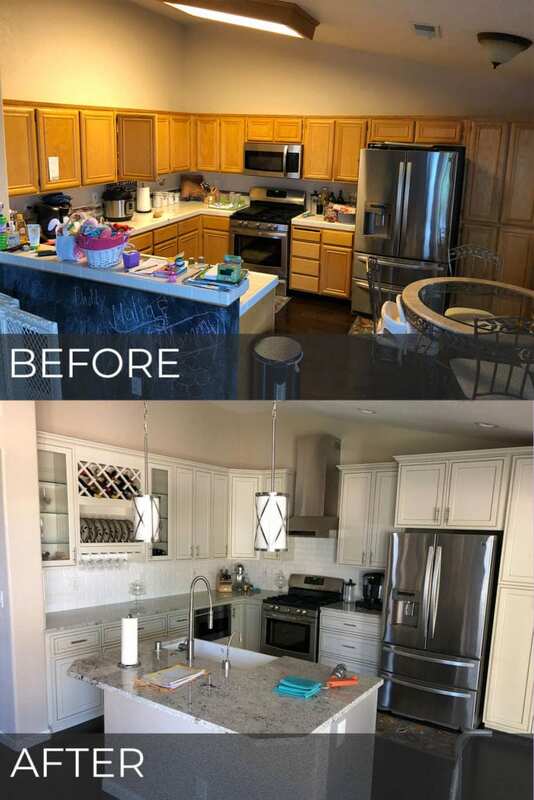 We transformed a standard kitchen into a beautifully modern space that really opened everything up for this family. To get started on your next project with a free quote, give us a call or get in touch today!